Prism is not many things, one of them is itself… for now. There is a history behind the identity crisis. As Bethany pointed out in her flagship post, Prism began as a Demon. Hearing McGann talk about it nowadays, you would think that we have found Richard Rorty’s ultimate intellectual ring, the one eye that encompasses all other. The pata-critical Demon owes its name in part to Alfred Jarry’s pataphysics, “_the science of imaginary solutions,“ from which we also get Pablo Lopez’s _pataphore, “an unusually extended metaphor.” When the folks at the SpecLab began playing around with markers and transparencies, they were in a sense blending science with play by making literal the idea that we all read differently. Although we all knew for centuries that there was room for interpretation, footnotes and marginalia safely occupied different places on the page, reinventing the author at the moment of its undoing. The Copernican move was to take the idea of difference seriously enough to overlap it. McGann, in most other cases a visionary, hesitated before the chasm. Today, he still wants to feed commentary to the Demon. Our prism ventures out on a different path. Then there is the knack that some folks have to try to reduce it to the most mundane digital tools. Two in particular surface often: Diigo and NowComment. I hope I am clear when I say, Prism they are not, and they are not for the same reason: They are not focused. 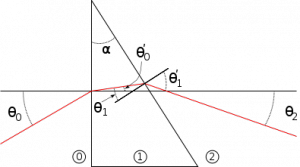 A prism refracts light according to a specific set of rules. Diigo and NowComment allow for a very diffuse set of comments and monotone highlights that cannot be wrangled easily for analysis. Both are helpful to provide feedback for one reader who has a vested interested in reading the comments. If we were to read interpretation as a social phenomenon, their usefulness runs its course. Our prism understands that we all wiggle under controlled vocabularies and that it is there that our differences thrive. On one of those slow dry desert days where Saint Anthony receives his motley crew of visitors, he has a vision. He sees a man wearing a wig before a strange glass pyramid. He sees strange markings on several pages strewn about a table rife with even stranger machines. A ray of light flashes through the window and the wigged man fumbles for the triangle. He offers it to the light like a bishop offering the host. Miracle of miracles. The crystal gives birth to a rainbow which fills up the room with the brightest colors, like the garments of his demons. Cite this post: Alex Gil. “On Demons and Prisms”. Published September 13, 2011. https://scholarslab.lib.virginia.edu/blog/on-demons-and-prisms/. Accessed on .